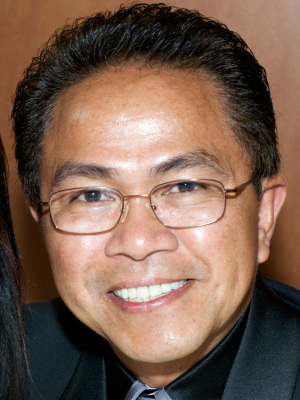 Dr. Primo A. Andres practices clinical as well as invasive and non-invasive and Interventional Cardiology. He reads and interprets non-invasive tests such as electrocardiogram (EKG), echocardiogram (ECHO), carotid duplex and peripheral arterial studies, stress testing including nuclear imaging. He also does cardiac catheterization, percutaneous coronary and peripheral interventions with stents and balloons. He is a pioneer in Endovascular Repair of abdominal aortic aneurysm with stent graft, that can now be done percutaneously through needle punctures in the groin in suitable patients. Are you concerned about your heart because perhaps you have a family history of cardiovascular disease such as heart attack, stroke or peripheral artery disease (PAD)? Or are you just wanting to stay ahead of the game by keeping healthy but you are not sure whether you can safely join programs to help you stay healthy? Is the cost of finding out a concern because perhaps of high insurance deductible or inadequate coverage? What can you expect out of the test? 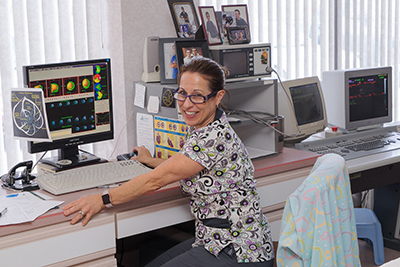 Realizing the dilemma of the working people who cannot afford to take too much time off even to attend to their medical needs, the Terre Haute Heart Center developed the One Day Heart Evaluation Program. Any person who has concern about potentially having a heart condition can contact the Heart Center to find out through telephone interview if he/she might benefit from the program. Dr. Andres screens all interviews and determines if such individual would benefit. That person is then scheduled to come in early one morning to have a stress nuclear imaging study, an echocardiogram, and blood tests looking at the cholesterol profile and blood sugar to screen for diabetes. Dr. Andres sits down with the individual after all the tests are done to complete the examination and summarize the findings. The individual goes home knowing everything there is to know at the end of the day. 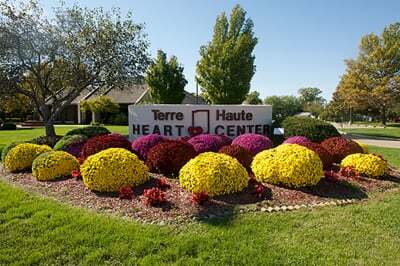 The Terre Haute Heart Center is a full service medical and cardiovascular practice that sees patients, diagnoses their condition, treats their problems, and follows up their progress and ensure the maintenance of their health. Our doctors are involved in the diagnosis and treatment of medical problems, particularly those affecting the circulation of the heart and the rest of the body. They are interested in making sure that the correct diagnosis is made through various means of testing and that the appropriate treatment is initiated and the progress followed up to make sure that the desired benefits are achieved. 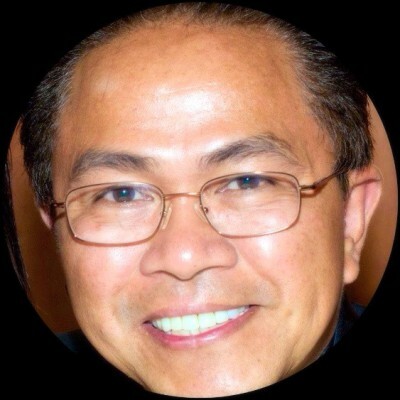 They are very much involved in the slowing down, if not the stoppage, of the progression of the illness and in preventing them outright by identifying and addressing the risk factors if the disease has not yet set in. They therefore treat hypertension, high cholesterol, diabetes mellitus and counsel against nicotine use. They preach healthy living practices including regular and safe exercises and good eating habits and avoidance and curbing of obesity. Since these are lifelong measures, you can count on them to be your lifelong partners in health. This outpatient diagnostic center performs non-invasive tests on the heart, carotid, abdominal and peripheral arteries at fraction of the cost of doing the tests in the hospitals. The bulk of evaluation of the heart, cerebral, abdominal including kidney, and peripheral circulation can be performed on an outpatient basis. And because of more efficient management they can be accomplished at a lesser cost that translates into more savings for the patients. 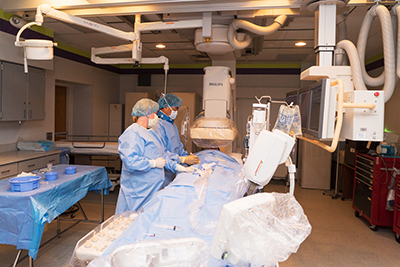 This is a free-standing full service diagnostic catheterization laboratory that does conventional angiography, digital subtraction angiography and even rotational angiography with 3D reconstruction capability all on an outpatient basis. The Terre Haute Heart Center Catheterization Laboratory does outpatient transfemoral (through the groin) or transradial (through the wrist) catheterization to look at the heart, brain, abdominal and kidney as well as leg circulation using various modalities of imaging including the usual use of iodine contrast agent (dye) that is injected through a catheter that is inserted in the groin or wrist artery and taking a movie of the flow (cineangiogram) or enhancing images of the circulation by subtracting the background picture (digital subtraction angiography or DSA) and/or by using a special technique where the imaging sensor is rotated during the time of acquisition that allows the 3-dimensional reconstruction of the picture (rotational angiography). All are done outpatient, with the patient going home on the same day of the procedure. Simpler cases of percutaneous coronary and peripheral intervention (PCI or PTA) can also be done with the use of stents to keep the arteries open. 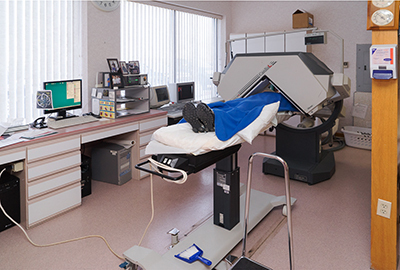 While most of the diagnostic procedures can be done efficiently and safely and at a considerably lower cost on an outpatient basis in our testing center and cardiac catheterization laboratory, most of the interventional procedures still need to be done in a hospital setting, frequently outpatient, but may sometimes require an overnight stay for observation. 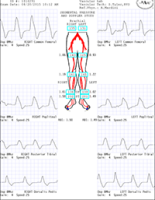 Electrocardiogram (EKG,ECG) - A recording of the electrical activity of the heart. 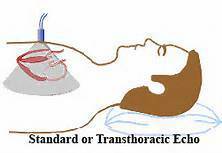 It may give a clue to the presence of previous heart attack, circulation problem, or rhythm abnormality. Holter Monitor - Continuous tape recording of the electrocardiogram, usually for twenty-four (24) hours, to look for intermittent rhythm abnormality. Event Monitor - Digital recording of the electrocardiogram that can be worn several days at a time to pick up less frequent episodes of rhythm abnormality. Implantable Loop Recorder (ILR) - Digital electrocardiogram recorder that is implanted underneath the skin overlying the heart that continuously records the heart rhythm and stores segments of it when activated automatically and/or manually. It can last three years. 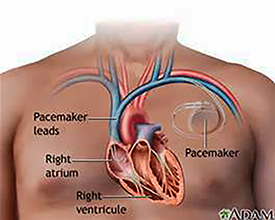 Pacemaker implantation - Minor surgical procedure where a small battery operated computer with wires (electrodes) that lead to the chambers of the heart is inserted under local anesthesia, usually through veins under the collar bone. Pacemakers stimulate the heart when the rate is too slow. They are capable of adjusting the heart rate during various phases of activity. 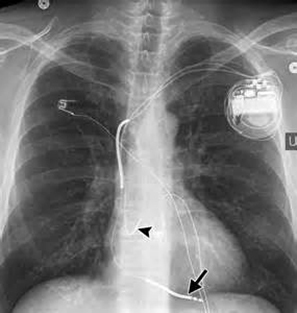 Automatic Implantable Cardiac Defibrillator (AICD) is a pacemaker device that can also automatically deliver an electrical shock within seconds of activation thereby terminating ventricular fibrillation that causes sudden cardiac death. Pacemaker Clinic - This is a pacemaker surveillance clinic that checks on implanted pacemakers, defibrillators and loop recorders. It is usually done through scheduled interrogation and through monitoring of data transmitted by the device through bedside wired and wireless monitors. 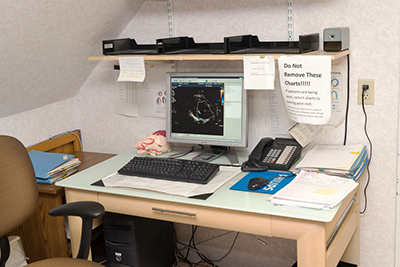 Occasionally, there is a need for a more detailed interrogation at the Heart Center with the use of a more sophisticated computer programmer. 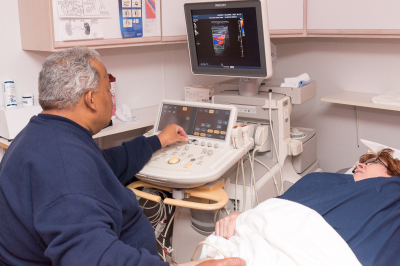 Echocardiogram (ECHO) with Doppler, Color Flow and 3 dimensional capability - An ultrasound study of the heart including the walls, valves and chambers, and the blood flow pattern inside the heart. It provides information about the size of the chambers, thickness and contractility of the walls, and abnormality in the valve function, either leaky or tight, that can result in turbulent flow. 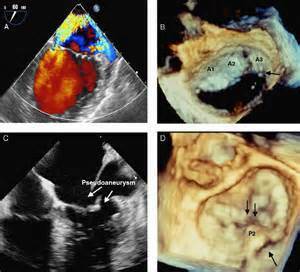 It can also show abnormal communications or even abnormal masses or growth in the heart and its adjacent structures. 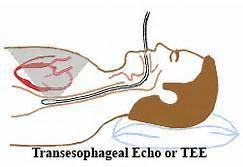 Trans-esophageal ECHO (TEE) - An ultrasound study of the heart like the ECHO but done with a flexible scope that is inserted through the esophagus and positioned behind the heart, similar in technique to the upper gastrointestinal endoscopy for looking for ulcers in the stomach. It provides better detail of the heart structures and flow pattern by avoiding the interference caused by the chest wall, ribs, and lungs. It is done under light intravenous sedation and using local numbing medication on the throat to minimize gagging and irritation. 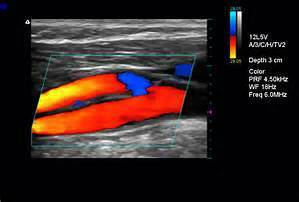 Carotid Duplex Scan - This is an ultrasound imaging of the arteries of the neck to show the blood flow pattern and any cholesterol plaque that may be obstructing the flow of blood to the brain that can lead to stroke. Arterial Duplex Scan - This is an ultrasound imaging of the arteries of body including the arms, the aorta, the renal (kidney) and the leg arteries to show the blood flow pattern and any cholesterol plaque that may be obstructing the flow of blood to the areas of the body that are supplied by the arteries, leaking of the arteries, or abnormal dilatation called aneurysm. 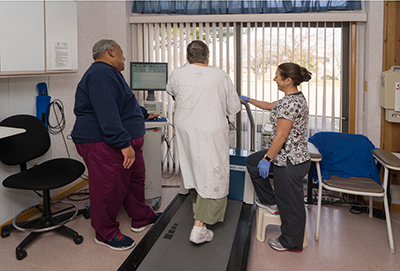 Exercise Testing - Usually done with a treadmill, the subject exercises following a set standard protocol while the electrocardiogram and blood pressure are monitored. This can provide valuable assessment of the subject's physical capacity, as well as determine the presence or absence of circulation problems. This is usually combined with either the echocardiogram or with the heart scanner to enhance its accuracy. Nuclear Imaging - A radioisotope is injected into a vein either at rest and/or during exercise which is then picked up by the heart. 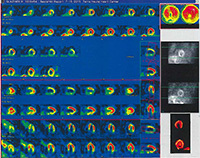 The small amount of radiation (less than a Chest X-Ray) is detected by the heart scanner. The scanner can detect uneven distribution of the radioisotope that may be caused by circulation problem. It is the most accurate non-invasive way of determining the contractility of the heart muscle (ejection fraction). Cardiac Catheterization - This is an X-ray guided procedure where an Iodine-based contrast agent (dye) is injected into the arteries and chambers of the heart. This is currently the most common way of demonstrating the percentage of narrowing in the arteries of the heart. 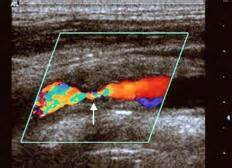 In more marginal blockages, the determination of the functional significance of the narrowing can be further enhanced by doing intravascular ultrasound (IVUS) or instantaneous or fractional flow reserve (IFR/FFR) before doing intervention. The pressures in the heart and adjacent structures are also be recorded and the heart output (the amount of blood that the heart pumps out) can also be measured. This is usually the basis for making decisions about the need for angioplasty or heart surgery. Segmental Pressure Measurement and Pulse Wave Doppler Study of the Legs - This is a good way for screening for circulation problems in the legs (peripheral circulation). The blood pressures of the legs are normally slightly higher than the pressures of the arms. When the blood pressure of the leg is divided by the arm pressure, a number greater than one (1) should be derived [ankle-brachial index (ABI) ratio]. Any ratio below one is therefore abnormal and is suggestive of obstructed leg arteries. In addition the doppler signal and pulse volume wave form may also be dampened. 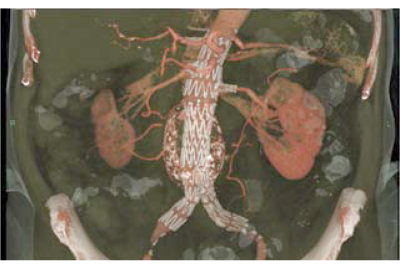 Peripheral Angiography - This is an X-ray procedure where an Iodine-based contrast agent (dye) is injected into the arteries of the body outside the heart. Special digital X-ray technique is then applied to record any obstruction in the arteries of the neck and brain, the aorta and its major branches including the kidneys and the arteries of the legs from the groins down to the feet. Percutaneous Coronary Interventions (PCI) - These are procedures that are done to open the clogged arteries caused by build up of cholesterol plaque. 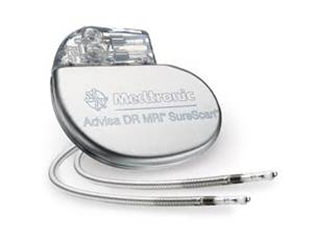 It is accomplished by inserting a catheter, usually in the groin, through which various devices can be introduced in side the coronary arteries. These devices are often times used in combination to achieve the best result. Balloon Angioplasty - First introduced for use in human hearts by Dr. Andreas Gruntzig, a Swiss cardiologist, in 1977, this opened up a new horizon in the treatment of coronary heart diseases. 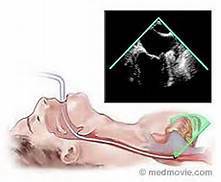 It works by compressing the plaque against the wall thereby immediately opening the clogged artery. The debris that is created is then cleared up by scavenger cells (white blood cells). 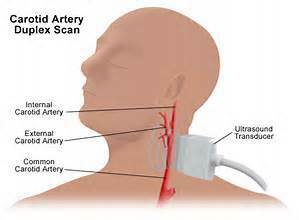 A favorable healing results in a new lining inside the artery that may stay open for several years. Depending on the complexity of the narrowing, there is a recurrence rate of 30-50% in six to twelve months. Coronary Stenting - This uses a stent that is made of a metallic "wire-mesh" that is mounted over a balloon. Once delivered in the area of the narrowing, the balloon is inflated, pushing and embedding the stent against the wall. The balloon is then deflated and pulled out leaving the stent to prop the artery open acting as a scaffolding to prevent it from collapsing and reclosing. This procedure leaves the biggest opening of the artery. The recurrence rate of the narrowing (restenosis) is 20-50% in six to twelve months depending on the complexity of the narrowing. The most commonly used stents nowadays are Drug-Eluting Stents (DES) that have medicine embedded on their surface that can reduce restenosis to <10% in 6-12 months in appropriate patients. Peripheral Angioplasty - All the above percutaneous coronary intervention techniques are also applicable to the peripheral circulation. Dr. Andres is doing balloon angioplasty and stenting on renal (kidney) arteries, iliac, and femoral (groin and thigh) arteries, and on the smaller arteries of the legs (tibial arteries). Endovascular Repair of Aortic Aneurysm (EVAR) - Aneurysm is a weakening of the walls of the artery of the body usually related to a build up of cholesterol. It is most commonly encountered in the abdominal aorta below the kidney arteries. This can progressively get bigger and can balloon out to eventually rupture if left unattended. The most common way of managing this before was by surgical repair where the ballooned out segment of the aorta is replaced with a fabric material. This entails a major operation with its attendant risk of heart attack, heart failure, stroke, kidney failure, leg circulation problems, among other potential complications. It usually requires 1-2 weeks of hospitalization and 1-2 months of recovery. There is now a new way of repairing some aortic aneurysm using a technique called endovascular stent grafting. This entails the insertion of a fabric-covered stent through needle holes or small incisions in the groins under X -ray guidance. It requires an overnight stay with even a potential for outpatient procedure in the appropriate circumstances. There is less stress to the heart, brain, kidneys and peripheral circulation so that the risks are considerably lessened. Recovery is not much different from that of a heart angioplasty. The first two procedures of this kind in Terre Haute were done by Dr. Primo Andres on October 18, 2001 using Medtronic AneuRx stent grafts with excellent results. Now he is doing it mostly through needle punctures in the groins rather than through surgical incisions. It is now possible to repair some aneurysm in the thoracia aorta and even in the upper abdominal aorta where there are vital branches by using fenestrated stent grafts (FEVAR) to preserve the side branches. 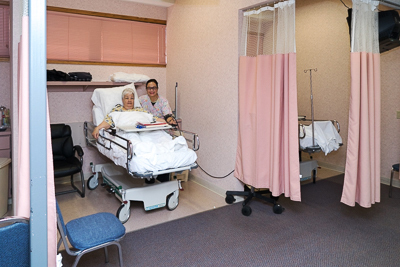 While they are not being done in Terre Haute yet, you can be referred to centers that are now doing them on a more regular or investigational circumstances. There is a lot to look forward to in the field of cardiovascular medicine and intervention. We are now consistently doing repair of abdominal aortic aneurysm through needle punctures instead of incisions in the groins. 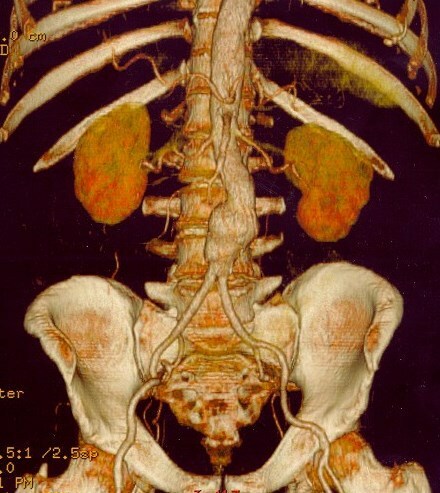 I have already mentioned the possibility of repairing aneurysms that involve the middle part of the aorta, where big branches that go to the stomach, spleen, small and large intestines and the kidneys arise, through the use of fenestrated stent graft (FEVAR). Aortic valve replacement is now being done in designated investigational centers through non-open heart techniques most commonly through the groin arteries similarly to endovascular aneurysm repair with very promising results. 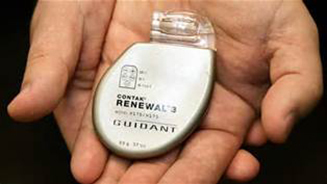 In the area of pacing and defibrillators, wireless devises are now being tried precluding the need for implantation of multiple electrodes that are often left behind even when they are no longer functioning potentially introducing another problem down the line. On the medical side of Cardiology, there are better medicines for heart failure and for control of diabetes mellitus and other cardiovascular risk factors. But in the long run, all these treatment modalities have their limitations and newer approaches means even more expensive delivery of care. We all realize that prevention of the disease will carry more weight in keeping us healthy so that more efforts are being spent on targeting the modifiable risk factors, encouraging healthy lifestyles and eating habits and pursuing regular exercise programs to keep our body limbered up and "well-oiled" to enjoy a long, active and healthy life.